Real estate mogul Donald Trump certainly has enough money to pay for his presidential bid -- and he's willing to foot the whole bill, even if it costs him a billion dollars. When a reporter asked Trump, just outside the Iowa State Fair grounds on Saturday, if he would throw a billion of his own money into the campaign, he answered without hesitation. "I would do that, yeah," Trump responded. "If I had to." And in answer to a question about his campaign's budget, Trump said that it was "irrelevant." "You saw I make $400 million a year," Trump replied, "so what difference does it make?" Pointing to his baseball cap -- the same red "Make America Great Again" hat he's worn on numerous campaign stops -- Trump reiterated that he'd do whatever it took to "make the country great again. That's all I want to do. That's much more important." 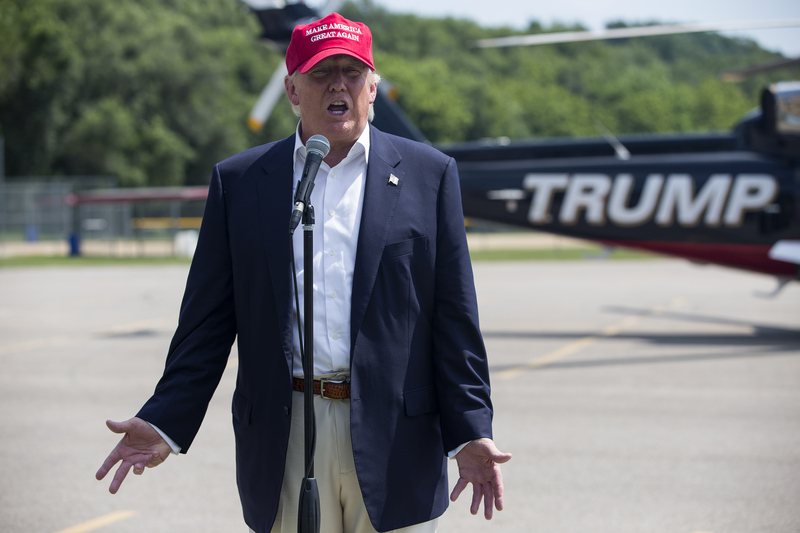 The GOP presidential hopeful added that "we can't make it great unless we make it rich." And never mind kissing babies -- Trump underscored just how much money he was willing to spend on voters when he wrapped up his press conference to give a children a ride in the helicopter he arrived in. It fulfilled an earlier campaign promise he reportedly made to the Daily Mail late last month. The billionaire businessman's campaign, marked by controversial statements and offensive remarks, has gained traction in the early voting state of Iowa. A recent Suffolk University survey put him ahead of the crowded GOP field, polling at 17 percent. He trounces his closest opponent, Wisconsin Gov. Scott Walker, by at least 5 percentage points. Trump points to these favorable poll numbers as proof that his campaign his working just as it should. "I don't think I've made mistakes," Trump told reporters in Iowa. "I mean, every time they say I make a mistake, they do the polls, and my numbers go up. So I guess I haven't made any mistakes." He pointed to his statements about criminal Mexican immigrants ("the people understood it, even though the press didn't want them to") and his slam against Arizona Sen. John McCain's war hero status ("I was saying how bad he's treated the veterans") as specific examples of his untouchable popularity. "My numbers went up," Trump said. He also asserted that veterans liked him better than McCain "because they know I'll take care of 'em." Rather than answering with specifics on policy proposals, the Republican contender for the White House instead attacked his opponents, focusing on establishment favorite former Florida Gov. Jeb Bush. "He says the United States has to prove to Iraq that we have skin in the game ... I think it may be one of the dumbest statements I've ever heard. Skin in the game! We don't have to prove anything," Trump said. "First of all, the Iraqi officials are a bunch of crooks, if there even is an Iraq -- which I don't think there is -- Iran is taking over Iraq. It was one of the dumbest things ever." When asked by a reporter what he would do specifically to stop Iranians from gaining a nuclear weapon, he replied, "Well you're going to have to use very forceful action. Very, very forceful action." Trump skipped out on giving a soapbox speech at the Des Moines Register's fair station, a traditional Iowa stop for most candidates looking to woo voters. Continuing a feud with the state's largest newspaper after it published an unfavorable editorial on his presidential bid, Trump said: "I don't do that because that paper is not relevant to me."